Greetings and salutations, gentle readers. My name is David Dodge, from Edith Maxwell's Quaker Midwife Mysteries. Author Maxwell wants to celebrate the first book about Rose - Delivering the Truth - being nominated for a Macavity Award (the Sue Feder Best Historical Novel Award), so she'll give away a copy of it to one person who comments here today. I am the man blessed with the love of the Quaker midwife herself, Rose Carroll. I am a doctor, and we first met several years ago at a meeting with a special concern for public health. We got to talking and, I'll tell you, I liked what I saw of this independent, smart, lovely woman. I resolved to begin courting her, if she'd let me. It transpired that she not only allowed it, but encouraged me. 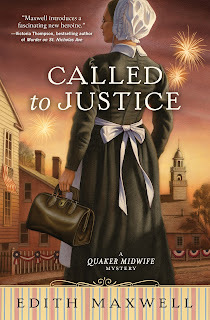 Let me share a special moment from the author's latest book about my dear Rose's adventures, Called to Justice, even though it is written from Rose's point of view, not my own. “What is this delightful place?” I asked. The full moon splashed a silver path from the distant bank across to ours. I pushed my bonnet off my head, letting it hang down my back, as I strolled to the edge of the platform. An attached ramp perhaps half the width of the platform extended down to the water about twenty feet, with rope stretched on either side of the ramp at waist height to serve as a handhold. The ramp ended in a small dock, which bobbed up and down with the river’s gentle movement. A metal cleat was inserted along the dock’s edge. “I love it.” I took his hand. “Walk with me to the end.” The two of us helped each other keep our balance as we made our way down the ramp, me clutching the rope on my right. I’d never been on a boat before despite living so near both the Powow and the Merrimack. I thought it might feel something like this with the water flowing under the dock and the faint rocking motion. A fish leapt out of the water and splashed back down, and an owl hooted in the trees. It looked like the moonlight on the water was a path leading straight to us. We stood in silence watching, our hands still clasped. “Let’s go up and sit on the bench for a spell.” David drew me back up the ramp and to the bench. I sat, but he remained standing. “Doesn’t thee want to sit down?” I asked. To my surprise he knelt on one knee, so my gaze went directly into his eyes. His hair was extra curly in the humidity and he was silent as he took my left hand with his right. He took in a deep breath and let it out before speaking. “Miss Rose Margaret Carroll, I would be extremely happy if you would agree to take my hand in marriage. I love you and want to support you and be by your side always.” Keeping hold of my hand, he drew a ring out of his left pocket and showed it to me on his open palm. What do you think? Will she accept my heartfelt proposal? I suppose you'll have to read the book to find out! In the meantime, tell our author if you plan to attend Bouchercon in Toronto in October, or what your favorite mystery fan conference is, and one commenter will win a signed copy of Delivering the Truth. Edith Maxwell writes the Agatha- and Macavity-nominated Quaker Midwife Mysteries, the Local Foods Mysteries, and award-winning, Agatha-nominated short crime fiction. As Maddie Day she creates the Country Store Mysteries and the Cozy Capers Book Group Mysteries. No, I won't be attending Bouchercon, although that, Malice Domestic and Left Coast Crime, all sound wonderful. Someday! And quite the scene, can't wait to read what happens! I'll be at Bouchercon. I enjoy Malice (have gone every year since 2002). I already have a signed copy of "Delivering the Truth" so you don't have to enter me into the draw. Honestly, I've never heard of Bouchercon but here's to exploration of all things new! Janine, it's THE biggest fan conference every year, and rotates locations, but it includes all crime fiction genres, so you'll hear thriller, noir, and suspense authors as well as traditional and cozies. I can't decide if Rose will accept David's proposal or not -- would he let her continue her work? And how does his mother feel about it? I can't wait to read Called to Justice to find out! I have read both books in this series and recommend them highly. I've never heard of Boucheron either. But it does sound like fun. Your book sounds interesting, too. Congrats on your nomination for "Delivering the Truth". I have been to Boucheron or any other reader's conference. I would really like to attend a reader's conference one day. Jana, you are the randomly selected winner! Please check your email. Thank you Edith! Email sent. I haven't been to a large Murder Mystery Conference but I would love to...hopefully maybe one day...thank you for the chance to win. I wish I had the opportunity to attend any mystery conference. I know I would enjoy it. Sounds interesting! Haven't been to Boucheron too far away. No, I won't be attending Bouchercon in Toronto in October and I've never haf a chance to go to a mystery fan conference. Congratulations and I would love to read more about Rose and David. Thanks for your giveaway. Jana Leah is the randomly selected winner! Congratulations, Jana. I wish I had a copy for everybody. She seems enchanted. Is it what she wants. Thanks for this opportunity.